That TDR Study Committee said in 2008 that the county should hire a consultant and conduct a study of the feasibility of a TDR program for the county. The motion before the Land Use and Transportation Planning Committee was to recommend to the Board of Commissioners that it issue the request for proposals already requested by the TDR Study Committee. Issuing a request for proposals would cost the county only a small amount of staff time, and the BOC could decide after receiving proposals not to go forward with a plan, Wayne Provost, director of Strategic and Long Range Planning for the county, told the Land Use Committee members. The majority of the Land Use Committee members decided that their objections to a TDR program outweighed the enthusiastic endorsement of such a program by the TDR Study Committee. The TDR Study Committee, appointed by the Board of Commissioners, made its report on Jan. 27, 2009. The BOC has taken no action since that time. After an initial discussion of TDR programs at its meeting last month, the Land Use Committee had invited members of the TDR Study Committee to attend Tuesday night’s meeting. Seven of the 16 members accepted the invitation, and two additional members wrote in support of moving forward with the request for proposals. The guests were not invited to the table at the Community Center in Veterans Park and were seated instead around the outside of the room, meaning they were viewing the backs of many of the Land Use Committee members. The Land Use Committee members spent 30 minutes talking among themselves before asking questions of their guests. Land Use Committee member Stuart Cofer said he had appreciated some of the information sent him by other Committee members, saying it allowed him to “kind of get educated a little bit” on the topic. Cofer said he also had gone on the Internet to learn about TDR programs in Georgia. He spent seven minutes reviewing what he had learned, often reading to the other Committee members. In the clip below, he is reading what he learned about the TDR program in Chattahoochee Hills, a city in the south of Fulton County. 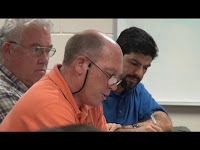 Officials of the city of Milton in north Fulton County expressed great support for their recently enacted TDR program when they met with Oconee County officials and citizens in April. The session was open to the public, but Cofer did not attend. A planner at Chattachoochee Hills told me in March that the program was operating successfully, though activity had been slowed by the downturn in the economy. Atlanta has preserved four historical properties with its TDR program, including the house where Margaret Mitchell wrote "Gone With the Wind." It was another 10 minutes before Land Use Committee Chairman Abe Abouhamdan asked the guests to respond to the comments of Land Use Committee members. Farmer Albert Hale, a member of the TDR Study Committee, objected strongly to Tollner’s comments. “I’ve been on a tractor all day,” he said. His 700-acre chicken and dairy farm was anything but a tax write-off, he said. Russ Page, another TDR Study Committee member, told the Land Use Committee that the Board of Commissioners had appointed a diverse group of people to the Study Committee. The Study Committee included developers, land planners, farmers, and people living in subdivisions, he said. The Study Committee heard speakers and talked to experts before reaching its conclusions that the county should go forward with consideration of a program. “We did nothing but study TDRs for six months,” he said. Page, a retired farmer, scientist and businessman, has been the most persistent advocate of TDR programs for the county, often speaking before the BOC, reminding the Commissioners that they are sitting on the recommendation of the Study Committee they created. Abouhamdan told the group at its meeting last month that he had brought the TDR issue to the Land Use Committee at the request of the Board of Commissioners, but the Commissioners have systematically ignored Page’s repeated calls for action and have never publicly asked for input from the Land Use Committee. Provost told me last month that the possibility of the Land Use Committee making a recommendation to the BOC came up at a staff meeting, attended by BOC Chairman Melvin Davis. Davis, accompanied by Commissioner Mark Saxon, attended the meeting on Tuesday, but neither of them spoke. The Land Use Committee vote on Tuesday gives the BOC the opportunity to say that it is following the wishes of a second citizen committee in overruling the recommendation of the Study Committee it had appointed. Land Use Committee members also are appointed by the BOC. Oconee County business leader Ed Perkins, a member of the TDR Study Committee, said on Tuesday night that he had been skeptical about TDR programs when the Study Committee discussions began, and he still was not certain one would work on Oconee County. The purpose of doing the study is to determine just that, he said. Attending the meeting on behalf of the TDR Study Committee, in addition to Hale, Page and Perkins, were Del Finco, Chuck Lee, Thomas Vernor, and Clay Bryant. Bob Smith and Melba Cooper were the Committee members who sent letters of support for issuing the request for proposals. The Oconee Enterprise mistakenly reported in its Thursday edition that the vote was 6-4 against recommending to the BOC that it issue a request for proposals. Recording Secretary Angela Helwig and Abouhamdan gave me the official recording of votes after the meeting. Voting in favor of asking the BOC to issue a request for proposals were Diane Border, Courtney Gale, Tammy Gilland, Kate McDaniel and Flynn Warren, according to Helwig and Abouhamdan. Voting against were Maria Caudill, Cofer, Bob Isaac, James Morris, Bob Sanders and Tollner. Abouhamdan did not vote. Land Use Committee members Philip Ashford and Kyle Martin did not attend the meeting. Sanders, who spoke against the TDR program last month on the grounds that it would involve the federal government, which it will not, was relatively quiet at Tuesday’s meeting. He said near the end of the meeting that his concern was that the property owner who sold her or his development rights could be “stuck in limbo” at some point in the future if, after selling the development rights to her or his property, others nearby decided to develop their land. He said he wondered if there was a “reverse clause” to allow the landowner to get out of the agreement. In a TDR program, a land owner in one area of the county, designated as a sending area, sells her or his development rights and puts a permanent easement on the property, precluding future development. The landowner in an area designed as a receiving area buys those development rights and uses them to develop more densely or obtain some other development advantage. An hour and 10 minutes into the meeting, which started at 7 p.m., Sanders said “the hour is getting late” and he wanted to bring the discussion to a close. Land Use Committee members commit to meet for only an hour. Abouhamdan accommodated Sanders, calling for a motion. Gale made the motion to recommend to the BOC that it issue a call for proposals for development of a TDR program. Gilland seconded the motion. After the vote, Abouhamdan asked if other citizens present had anything they wanted to contribute to the discussion. Sarah Bell spoke, saying she wished she had been given a chance to speak before the vote had been taken. “What you all just did was discourage progress,” she said. “One of the reasons I moved to Oconee County was for the green space, which is part of the quality of life,” Bell said. “I think we’ve lost a lot tonight,” she said.